In this article on Digestate Spreading we have brought together the most authoritative information on the subject. We start with a definition of what digestate spreading is, and we go on to cover digestate produced to PAS110 Quality Protocol standard. That’s followed by the best practice from WRAP in the UK, in the use of spreading equipment and then 3 digestate application case studies. Finally, we end this page with the digestate spreading management and storage options. Digestate spreading is a method of fertilisation which involves the application of a nutrient-rich product, formed through anaerobic digestion. Differing from compost which is produced through aerobic micro-organisms and requires oxygen, digestate is made up of a mix of indigestible material and dead microorganisms. This product is then applied to the field using a spreader, which is used to evenly distribute to the digestate and ensure an even spread across the ground. Digestate spreading can be used to treat nutrient deficient soil and ensure the effective growth of crops going forward. The process and amount of digestate are determined by a test to ensure that the correct level of nutrients is inputted into the soil. Digestate is produced through a process called anaerobic digestion, which involves a series of biological processes. During this process, microorganisms break down materials during the absence of oxygen. The materials that can be used for AD fertiliser production include biodegradable products such as food remainders, livestock slurry and waste crops, including grasses. It’s produced to PAS110 Quality Protocol standard to:. Provide an excellent source of NPK and S to replace chemical fertilisers. Improve soil structure, drainage, water retention and aeration, providing a better rooting environment for plants. Possess slow nutrient release qualities. The material continues to breakdown within the soil, reducing nitrogen and phosphate leaching. Improve the workability of soils, especially heavy clay. Improve water retention in light soils. Enhance resistance to soil compaction and erosion. Best practice is to apply digestate using a band spreader with a trailing hose or shoe, or a shallow injector. Applying digestate close to the plant roots in this way will increase the amount of nitrogen available to the crop, and reduce the amount lost to the atmosphere as polluting ammonia gas. In contrast, broadcasting digestate with a splash-plate or similar would waste a lot of the nitrogen, with only a very small proportion becoming available to the crop. 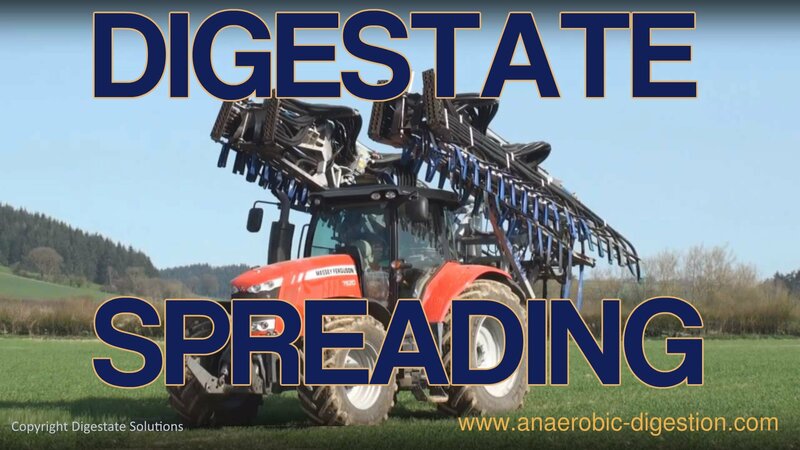 Further information on spreading equipment is available in the guidance document published by ‘WRAP Cymru Digestate: Realising the fertiliser benefits for crops and grassland’. The main nutrients which digestate contains are nitrogen, phosphate and potash. Additionally, there are small amounts of other beneficial elements to help keep the soil in good condition. Its high nitrogen content means it is suitable for using as a replacement for artificial fertiliser containing nitrogen. The level of nutrients in different types of digestate will vary, however. So it is important either to carry out testing before applying it to the soil or to get full information from the supplier if the digestate is being brought in from outside your own farm. Digestate Spreading Case Study 1 – Notes from J.M. Stratton & Co.J.M. Stratton & Co.
Our anaerobic digestion (AD) plant produces around 75,000 tonnes of nutrient rich PAS110 compliant digestate fertiliser. We are now spreading this on most of our arable and dairy grass across the farm. This provides all the nitrogen, phosphate, potash and sulphur for our crops, plus a good dose of trace elements and organic matter. We test the product daily when we are spreading, and apply the right quantities to our crops in order to maximise the utilisation of the available nutrients. We have a network of storage lagoons across the farm so we can apply the digestate at exactly the right time to the crops.We spread using two appliances. Most goes on using an umbilical pipe system, with a pump at the lagoon end and a 27m Vogelsang applicator boom on our John Deere tractor. This can pump up to 3,000m, using a “cow-horn” pipe management system. via J.M. Stratton & Co. This is a video of RC Baker LTD spreading Digestate on all our wheat stubble using two of their amazing tankers. One is a Claas Xerion 3800 Saddle Trac with a mounted and towed tank. The boom width is 24 metres in this video to match our tramlines but they can go upto 32 metres. The second tanker is a Claas Xerion 3800 Trac VC with a trailed tanker and a 15 metre trailing shoe as the operator is just getting used to the machine as it’s his second day on it. The ground which the digestate is spread on will be direct drilled with OSR and due to the high Nitrogen content no artificial fertiliser is required at drilling. Once the digestate or liquid sludge has been transferred from the road tanker to the headland tank, Digestate Solutions then use the most up to date equipment and latest technology e.g. GPS System, to apply the sludges accurately providing an even application to the land. 1) A liquid (around 7% DM) or after separation as both a liquid (around 2.5% DM) and a dry fraction (around 25% DM) these depend on the separation equipment also (either screw press or centrifuge). Is is still digestate whether liquid or dry. 1) EA Permit exemption, this is for Ag plants using ag feed-stock, the only restriction is if NVZ regulations apply whereby the period of closed spreading time storage is required. 2) EA Standard permit, this applies where waste-feedstock is being used, it is a simply but inflexible permit. This has restrictions on the amount of dry fraction storage, as under this permit the dry fraction should be stored inside and usually requires some sort of Odour management. 3) EA Bespoke permit, This I can best describe as a site/area specific permit that takes into consideration design and local area considerations. This is time consuming and expensive but could be more flexible than a Standard permit. The limit on storage is for the dry fraction on a standard or bespoke permit. Digestate spreading COOL wheels! Awesome kit. DRAAAG machine.